Award-winning novelist Chris Womersley delivers a provocative portrait of the artist as a young art thief. 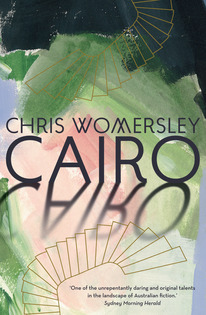 There is a sense of anticipation and foreboding present throughout Chris Womersley’s third novel, Cairo, as its teenaged protagonist Tom Button, with a ‘… a vague, unarticulated plan to transform himself into a scholar’, finds himself living in his late Aunt Helen’s apartment in Cairo, a block of flats in Nicholson Street, Fitzroy. The middle-aged Button recalls Cairo, its people and the events of that ‘breath of summer and winter long since past’ that return to him in dreams, but as ‘… vital and alive as I remember them being in life’. The novel includes a fictionalised account of the infamous 1986 heist of Picasso’s Weeping Woman from the National Gallery of Victoria that Tom finds himself, by chance and choice, involved in. He also has his first real experience of love with the more mature Sally, wife of Max, the mastermind of the heist and a composer. The theft of the painting, of Tom’s heart and his innocence, mix together in this novel that dares to go outside of the lines of genre. Is it a coming of age story? Is it crime fiction? Is it a political novel? It is all of these. Keen to flee his home town Dunley (‘Where a man’s worth was measured by his ability to stake a fence or identify the number of cylinders in a car by sound alone …’), his two sisters (one a consumer of Iced VoVo’s and Women’s Weeklys) and parents, especially his mother (whom he is convinced is not his mother), Tom takes up residence in the art deco apartment building that ‘… gave one the impression of being on board a liner moored at the edge of the city, waiting for clearance to sail’. The first flush of love is like a nostalgia for the present; we know on some molecular level that it cannot be repeated. The tragedy is that one can never calculate such instances until one knows there will be no more of them. As a crime novel Cairo works, with foreshadowing of the theft, a murder, double-crossing and even double-double-crossing, red herrings and pay-offs along the way that kept me turning the pages. Do you think anyone would bother making a painting or a novel if they couldn’t attach their name to it? Artists talk about the joy of making work, but I wonder if they’d get so much of this so-called joy if they had no chance of being known for it. Would you write a novel if it was published anonymously? Because the forger doesn’t sign her name to a work, there is no ego involved. The pleasure is in the creation, in putting beautiful work into the world. It is as I said before, quite pure. They analyse game shows and fashion magazines and this kind of thing. Advertisements. Ask anyone who goes there. It’s all about bringing everything down to the level of the average Joe. There’s that bloody ordinary man again. Rounding a bend or cresting a hill in the family car when I was a boy, long before I knew my left from my right, I was always convinced that the approaching cars wouldn’t know which side of the road we were driving on and we would all be killed in a head-on smash. Cairo seems at first a lighter read than Womersley’s previous novels The Low Road (2007) – there is a lovely self-deprecating reference to this in Cairo – and Bereft (2010) but after finishing the book I still sense that ‘little bruise’ author Cate Kennedy believes is the mark of a story well told: a tiny palette of colours, with a deep purple at its centre, that may take some time to fade.